To add one or more SONOS streams to a musicBox multi-room audio system, you must add a SONOS Connect for each SONOS stream. We recommend you install one, or perhaps two, SONOS Connect devices. 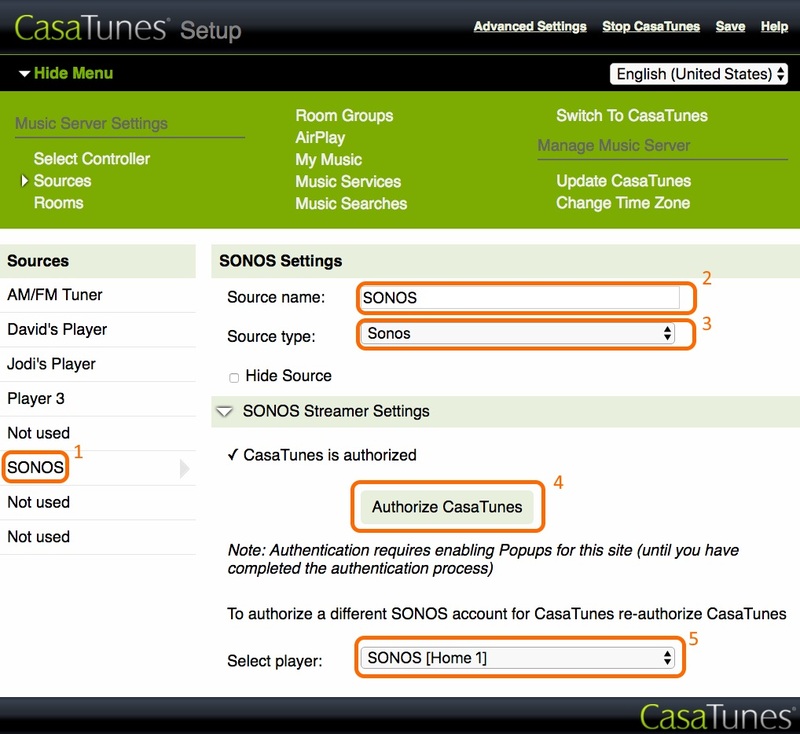 To add more than 2 SONOS Connect devices, you will need to uninstall some of your CasaTunes media players. For each SONOS Connect device, you must physically connect the audio output from the SONOS Connect device to the next available input source on your musicBox power amplifier. Depending on the type of input source connection use either the analog L/R, or digital optical. Depending on the number of SONOS Connect devices you are using, we recommend 2 different (room) naming strategies for these devices. If you are using a single SONOS Connect device, we recommend you set the room name of your SONOS Connect device to SONOS. 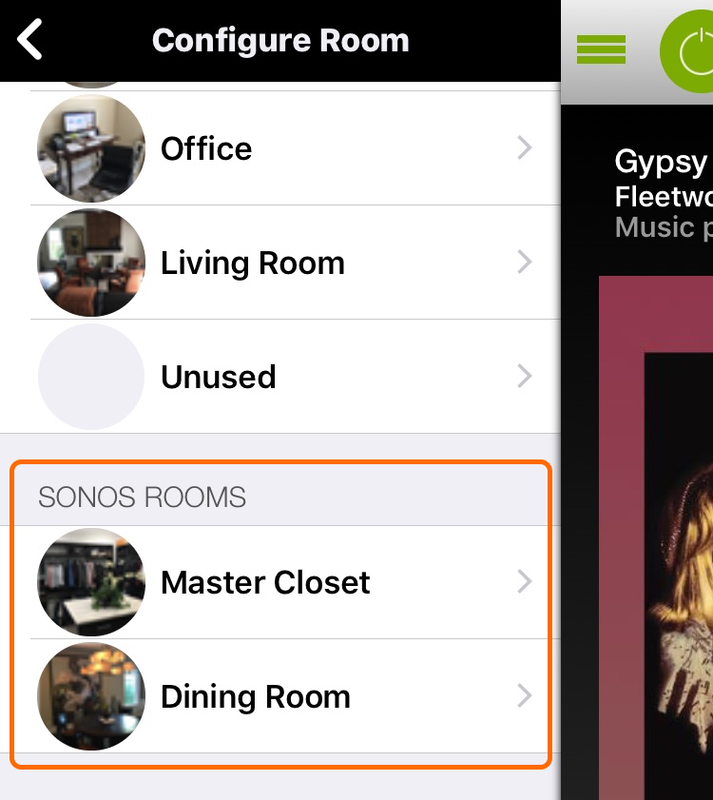 If you are using multiple SONOS Connect devices, we recommend you configure the room name of each SONOS Connect device based on the name of the primary user of the device, for example, "David's SONOS" or "Jodi's SONOS". Assigning a user's name to each device, makes it clear to users whose SONOS device is selected, and helps prevent users from interfering with each others music selections. After you have configured all your SONOS Connect devices, add any additional SONOS speakers to the household and follow the SONOS instructions for configuring these. The musicBox works with all SONOS speakers, including SONOS One, Play:5, Playbase, Playbar, Connect:AMP and Amp. The musicBox automatically discovers and configures these speakers as additional rooms. 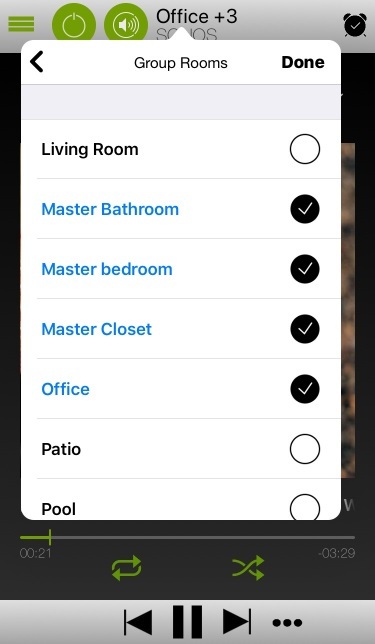 For example, in Figure 1, the musicBox automatically discovered "Master Closet" (SONOS One speaker), and "Dining Room" (SONOS Play:5 speaker). Congratulations. You have completed configuring your SONOS system. The next step is to configure the musicBox. Select the Sources menu option in CasaSetup. Step 4: If this is the first time you have configured a SONOS Connect device with the musicBox, you must authorize the musicBox and allow the musicBox to control your SONOS devices and speakers. Click on the "Authorize musicBox" button and follow the prompts. Note: You may need to enable Popups in the browser for this step. Once you have completed the authorization process successfully, close the authorization tab and return to the CasaSetup tab. Click on "Save" to save your settings. The musicBox automatically configures your SONOS Connect devices that are connected to your matrix amplifier, to use a fixed volume output. musicBox uses SONOS Connect devices connected to your multi-room audio system as both, a music streamer and as a gateway to connect to other SONOS speakers. The SONOS Connect devices connected to your multi-room audio system appear as sources, while the SONOS speakers appear as rooms. With the musicBox you can listen to music playing on any SONOS Connect device or SONOS speaker in any combination of rooms, regardless of whether they are multi-room audio powered speakers or SONOS speakers. If the source is not a SONOS Connect source, then you will not be able to listen to this source on your SONOS speakers, only on the speakers connected to your multi-room audio system, as there isn't a way to switch the music from these sources to a SONOS speaker. Tap the room name "Office"
When a room is grouped together with other rooms, you can change the volume for the group of rooms, or each individual room. The musicBox uses SONOS Connect devices connected to your matrix as both, a music streamer and as a gateway to other SONOS speakers. 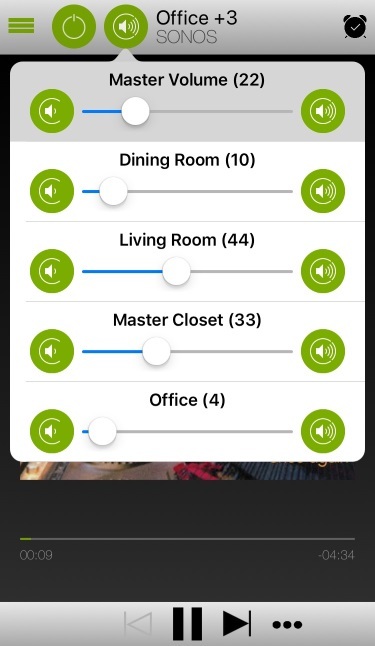 Using the musicBox Apps for Android and iOS you can control the music and which rooms your SONOS music plays in. 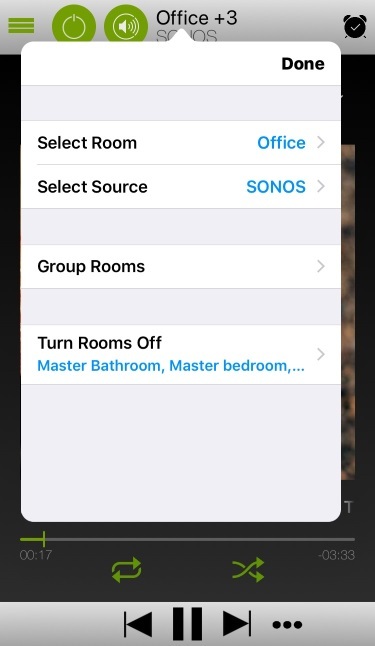 Use the Group Rooms option in the App to select any combination of matrix zones and/or SONOS speakers to play your SONOS music in. Under the hood, the musicBox selects the SONOS Connect device on the matrix as the source for the selected matrix zones, and groups the SONOS Connect device with any selected SONOS speakers. When you group a SONOS speaker to a matrix zone, the musicBox intelligently selects a SONOS Connect device to use if there is more than one SONOS Connect device connected to the matrix switch, groups this device with the SONOS speaker, then selects the SONOS Connect device as the source for the matrix zone. The App makes it easy to group the rooms where you want to listen to your music. Simply check each room in the Group Rooms screen, and to remove a room from the group, simply uncheck the room. With the musicBox, you can seamlessly manage the volume for both matrix zones and SONOS speakers. Use the Master Volume control to change the group volume, and use the individual room volume controls to change the volume in a specific room. 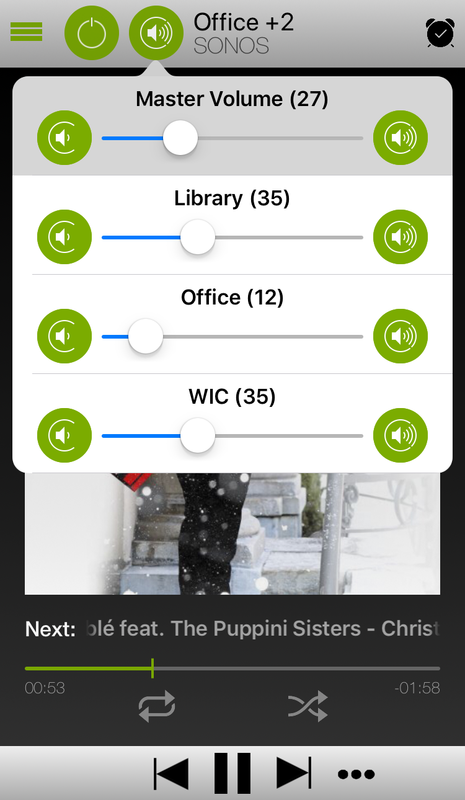 If you find yourself often selecting the same group of rooms, and adjusting the volume in these rooms, you can save these settings as a musicBox Room Group. Room groups simplify managing your music in multiple rooms. When you turn on a room group, or join a room group, it powers on all the rooms that are part of the room group, sets the same source for each room, and adjusts the volume for each room appropriately. Use room groups to implement Party Mode and Scenes. 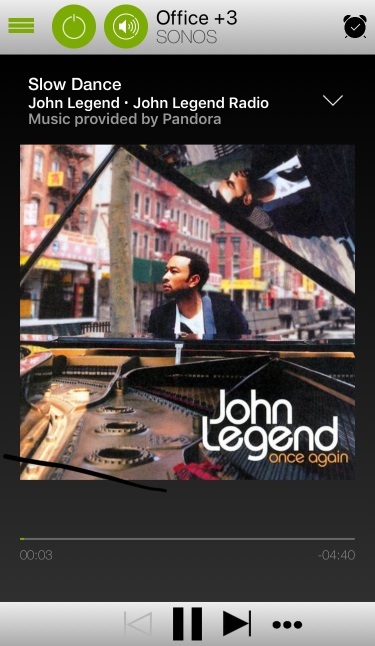 Since the musicBox uses the official SONOS cloud based Control Application Programming Interface (API) to control SONOS Connect devices and any additional SONOS speakers, the musicBox displays much of the same information that is available in the SONOS App (see side-by-side Now Playing images above). With the musicBox you can select to listen to any SONOS Favorite or Playlist. 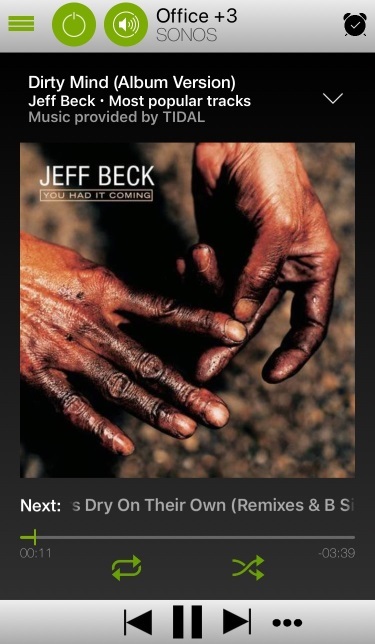 If you would like to browse and search for other music, simply tap the Now Playing artwork in the musicBox App to open the SONOS App. Once you have completed selecting your music, press the top left button in the SONOS App to return back to the CasaTunes App. 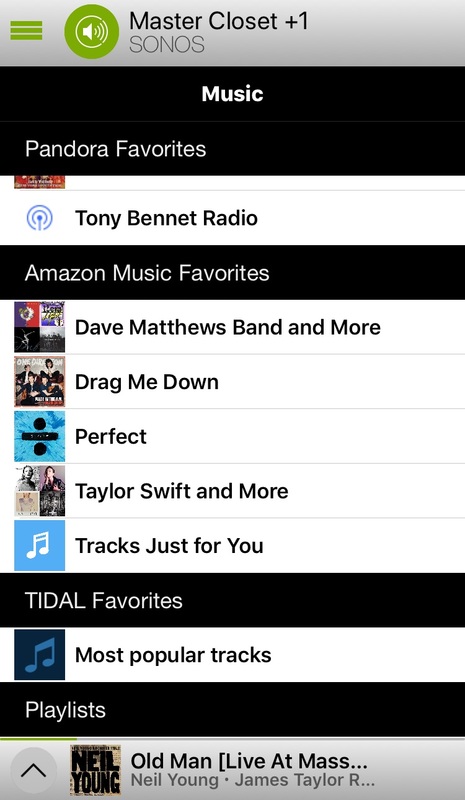 The musicBox automatically organizes your favorites based on the music service type (for example, Pandora), further simplifying the selection process. We recommend creating a robust list of your SONOS Favorites and Playlists. This way you can quickly select your music without ever having to leave the musicBox App.